This is a listing for a sterling silver and amethyst pendant and earring set. 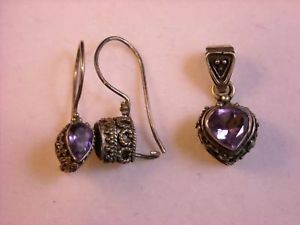 The earrings are on loops and have drop shaped stones in ornate settings. Each earring measures 1" x 1/2" x 1/4." The pendant has a heart shaped stone in an ornate setting and hangs on a loops. It is marked .925 on the back. It measures 1" x 3/8" x 3/8." They are in excellent condition.